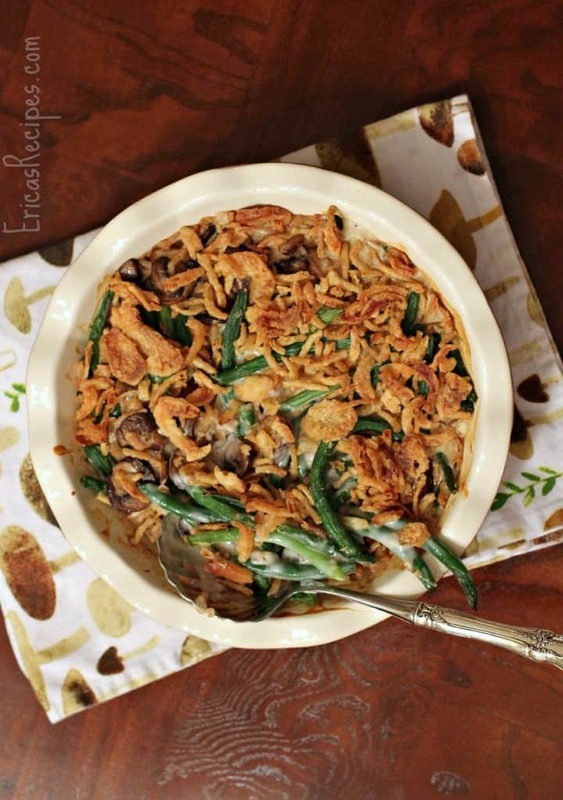 Are you looking for fresh green bean casserole recipe ideas? Don’t look any further. 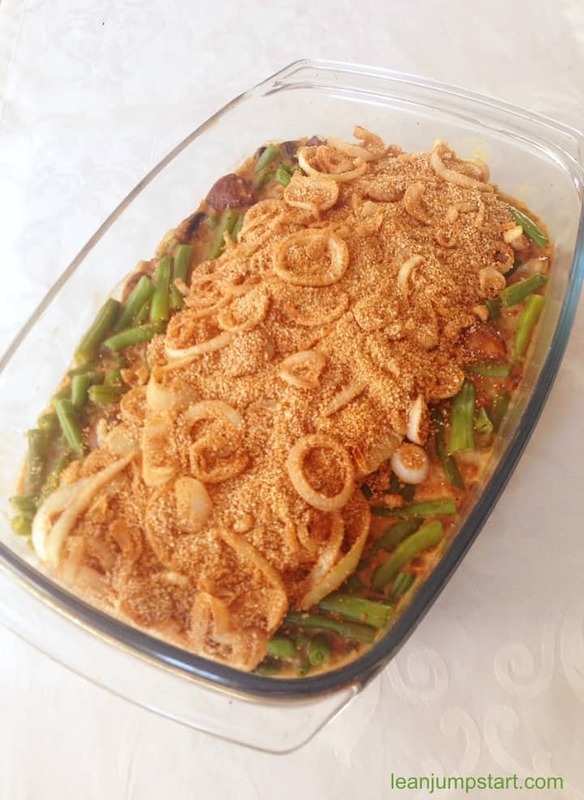 In this blog post you’ll find the top 7 string bean casserole recipes – each with a delicious twist on the classic recipe. 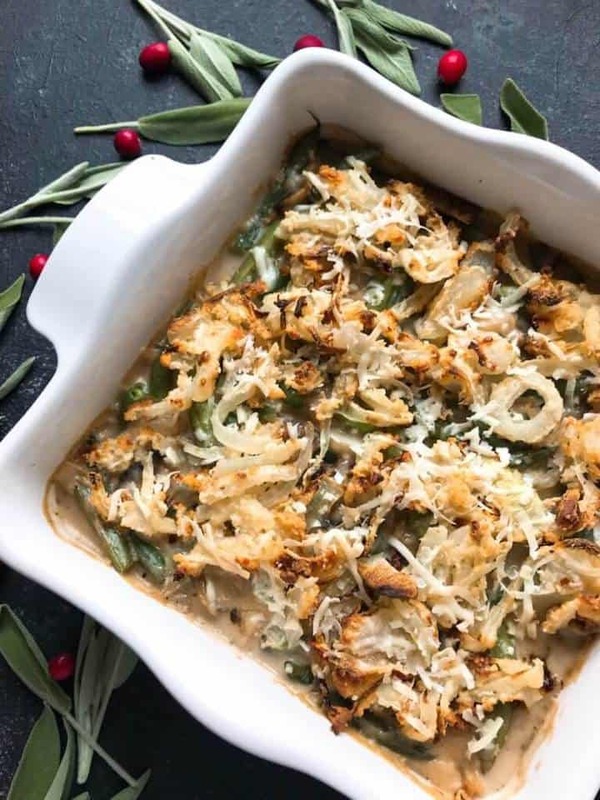 When over 60 years ago Campbell invented the classic green bean casserole, nobody would have thought that it will become the epitome of comfort food and Thanksgiving side dishes. 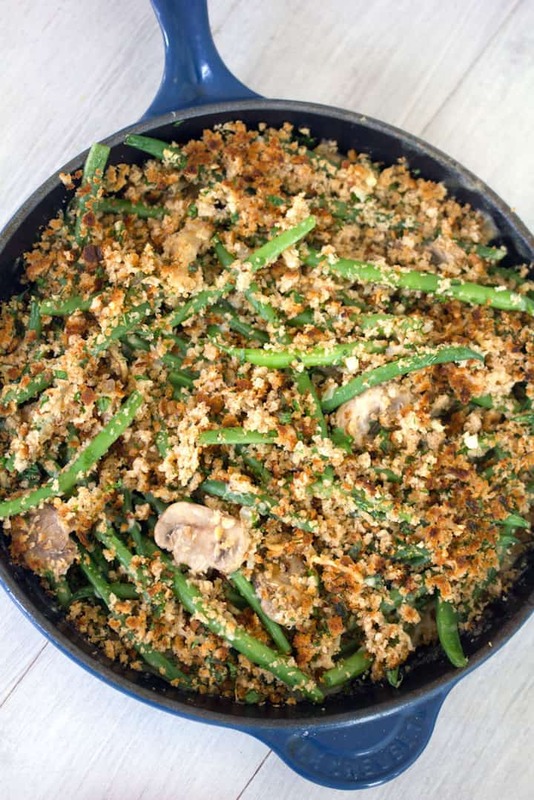 If you are living in the USA, then you probably know this tasty green bean side dish. People in the US prepare it traditionally with canned legumes, canned mushroom soup and French fried onions. There is definitely a nostalgia to it, but let me dare to say, that these baked string beans taste much better, if you use fresh products. As I’ve been born in Europe I’m not used to the traditional Thanksgiving food. Luckily my dear blogger friends could help out. Find in the following 7 elevated versions of thanksgiving green beans. All presented recipes use cooked green beans which were boiled in a small amount of boiling water. Some of the following recipes will call for butter. To reduce the amount of saturated fats you may want to replace it with olive oil. Others will call for French fried onions as an absolute key ingredient to create the perfect thanksgiving side dish. I understand this as it might be pretty rare for most of us to introduce a new dish to our dinner table on a big day. And yet you are on leanjumpstart.com, a food blog that features mostly plant based clean eating recipes. I hear you, too! So, if you are looking for a 100% clean eating side dish, please jump to recipe number 5 or 6 or click through to my own interpretation at the end of this blog post. 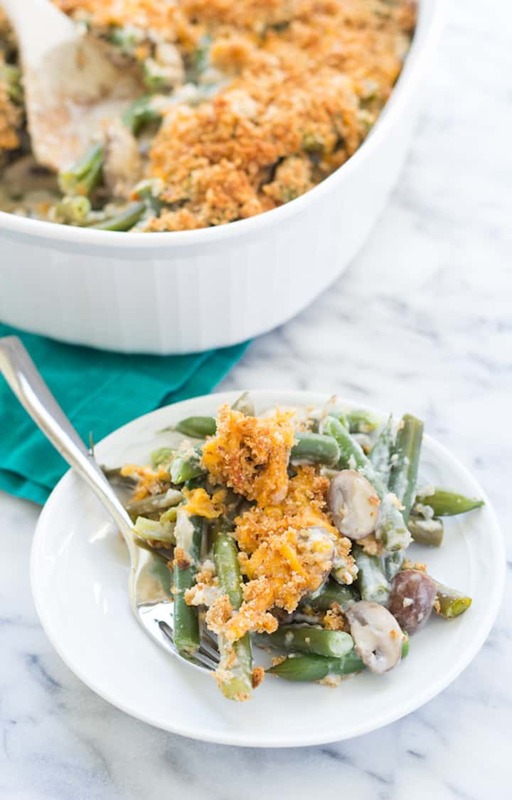 For her vegetarian recipe from scratch Kristine uses only fresh ingredients like fresh baby bella mushrooms, fresh green beans, onion, garlic, and a homemade cream sauce. To get her “perfection in a bite” she combines it with a cheesy, crunchy whole wheat breadcrumbs topping. To save some salt she uses a low sodium vegetable or chicken broth. If you click through to her recipe, you’ll also learn how to make home made whole wheat breadcrumbs. Kelly smothers her freshly cooked beans in a homemade mushroom Cheddar cheese sauce. If you like creamy, cheesy sauces this will be your favorite recipe! She actually recommends French’s French Fried Onions over her failed try with breaded and fried shallots. According to her experience, the store bought convenience food has a great deal of flavor and remains crispy even after the casserole is baked. Sidenote: Please be aware that French Fried onions are highly processed foods, containing lots of saturated fats and sodium. But they are of course huge time savers and you can’t go wrong, especially if your family is expecting the traditional flavor. If you want to add something special to your feast, Kim’s version is for you and worth the extra step. This side dish boasts some extra flavor from adding Parmesan cheese, water chestnuts, black pepper and a heavy hand of garlic. Kim shares also some valuable instructions how to make your own onion topping in the baking oven. These are not only healthier than the store bought French fried onions, but also lower in fat. In her recipe post Jodie makes a plea: “Please, stop with the canned cream of soups already”. And… “Make your Thanksgiving table a little happier.” I couldn’t agree more! She has never been impressed by the gloopy side dish and thinks it has a one-note taste reminiscent of a musty basement. Her own creation from scratch is so much better. As a special variation she uses dried mushrooms. 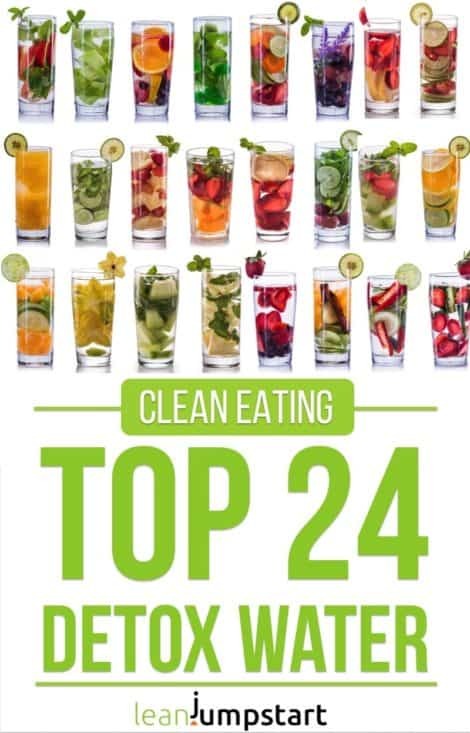 Melissa is the first in this roundup, who shares a clean eating recipe, that means she doesn’t use any butter and/or French fried onions. On top of that she features a super light cauliflower cream I adore. If you and your family are used to the natural flavors of eating clean, then I highly recommend this vegan, paleo and gluten free side dish. It is also probably the best recipe option, if you are watching your weight. I recommend to taste it with a bit of soy sauce. The recipe for her “haricot vert baking dish” Sue spotted in a Thanksgiving issue from Cooking Light. It is another healthy interpretation of the classic recipe. Fresh green beans and onions are married with a homemade cream of mushroom sherry sauce. The topping is made of crunchy whole-wheat bread crumbs. The fact that she uses a skillet (or large pot) gives her the flexibility to put eggs on the top turning this dish into a hearty breakfast. If on Thanksgiving clean eating has absolutely no priority for you, then you might want to consider Erica’s recipe. 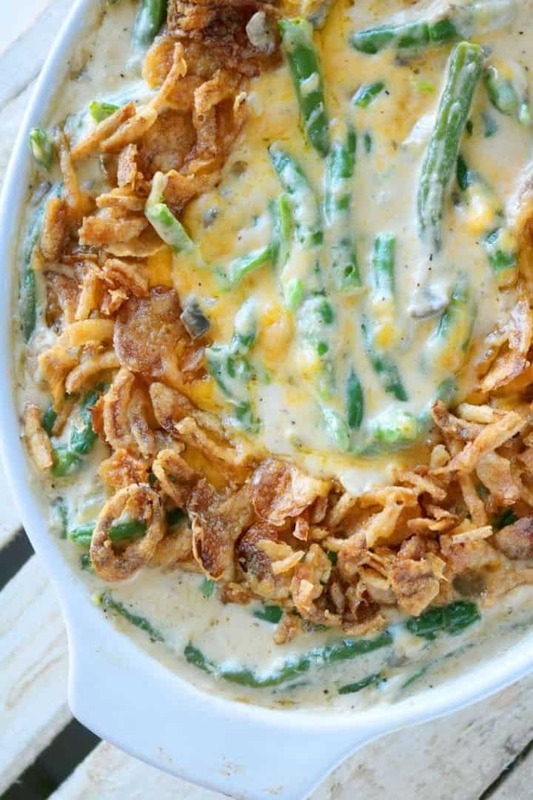 Her dish comes closest to the traditional Campbell’s green bean casserole recipe and you can whip it up in a hurry. 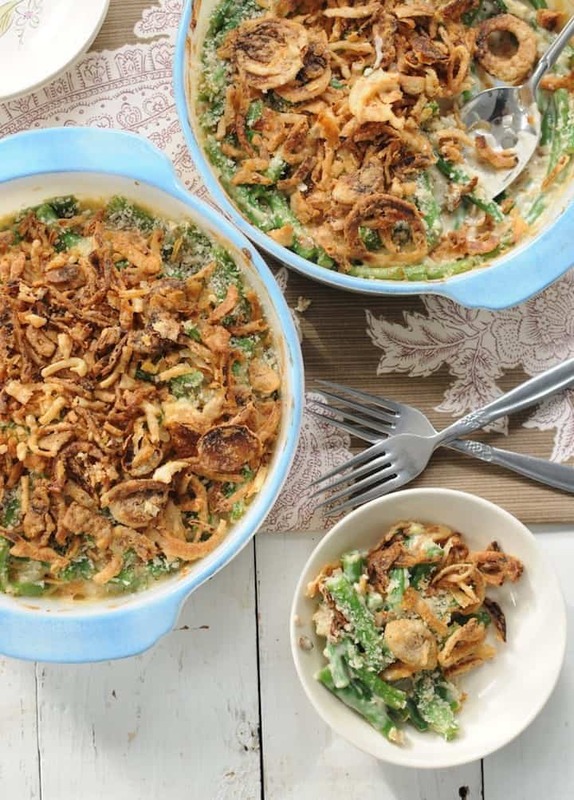 For her fresh green bean casserole she uses the typical shortcuts like a can of condensed cream of mushroom soup and French’s fried onions. Tip: As the canned soup is usually very salty I recommend to leave out salt and pepper or use it very scarcely. 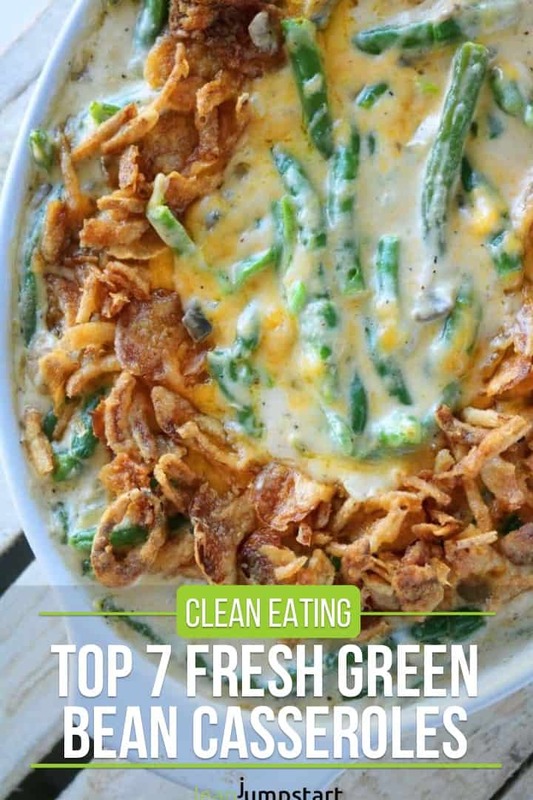 I hope my roundup post with the 7 world best green bean casserole recipes could give you some inspirations. Flashed by all those wonderful ideas, I’ve experimented with a filling high fiber meal with frozen green beans you can eat as main dish all year around. It’s vegan, low fat, clean and perfect if you want to lose weight. 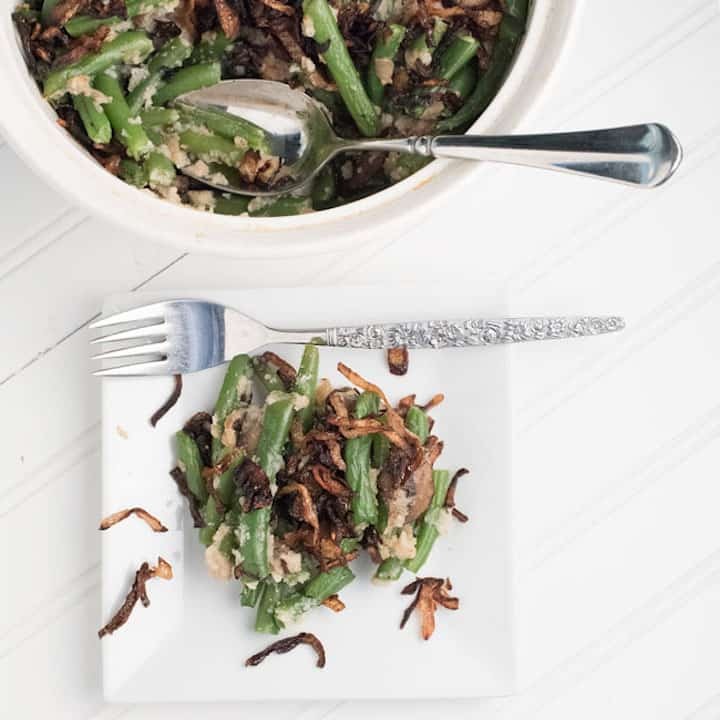 Click through to my vegan green bean casserole recipe.